Happy Halloween Skull Badge in a lovely pumpkin orange with happy Halloween written in a spooky Halloween font and a small white cartoon skull illustration in the bottom corner. 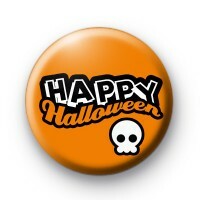 We have thousands of Halloween button badges to choose from on the website & we hand make all of our badges in our family run workshop. Standard 25mm button badge. Check out our range of Halloween badges, witch badges, pumpkin badges & ghost badges in our Halloween badge section.